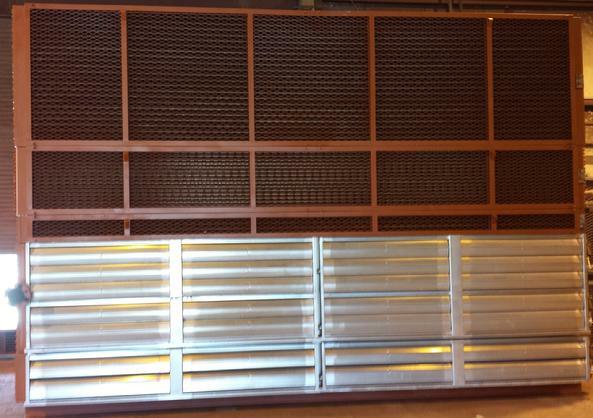 API GALVANIZED AND ALUMINUM LOUVERS, DAMPERS, SHUTTERS FOR THE HVAC INDUSTRY. DESIGN AND FABRICATION TO MEET INDIVIDUAL CUSTOMER REQUIREMENTS. We strive to offer our customers a superior product at a competitive price. Extruded pivot holes for bearings help absorb vibration and increases louver life. The application of a bearing in a bearing, which fit in the extruded hole on the side frame is recommended for extreme vibration conditions. High Heat or Stainless Steel are also available. Standard bearings are Acetyl Material, 30% glass-filled, 2% Teflon. Fiberglass Reinforced. Melting point is 495 Degrees. Blades: 7 inches wide, formed blades may be parallel or opposed. Blades are precision aligned and balanced for stability and alignment. Maximum blade length 55-3/4 inches. Frame: 6-3/4" deep. Welded and braces (no bolts) to insure stability and alignment. Welded Frames are not affected by high vibration. Mounting Flange: 2 inches unless otherwise specified. Operator: Louver operation may be controlled in individual or multi-unit applications by either manual or motor operators. Manual Operator is designed and manufactured to be completely trouble free. 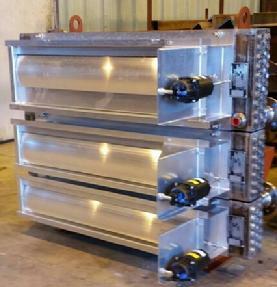 Manual operated louvers are shipped with handle and (7) position lock plate for regulating air flow, which is adjusted at the factory before shipment. Automatic Louers are shipped with actuator mounted and adjusted for maximum performance. Actuator type and size must be specified for proper mounting mechanism. Louvers are adjusted for maximum performance and inspected by quality control to insure our high standard of excellance and customer satisfaction. Standard Hail Guard Material 1/2" x 1" welded wire or to customer specifications. Bolt On or Integral. Standard Bug Screen Material 1/8" x 1/8" wire mesh. Bolt on or slide-in-removable or to customer specifications. We are always looking for new ways to promote partnerships with our customers, so that we may both face the challenge of an ever changing energy market. A PARTNERSHIP FOR THE FUTURE!